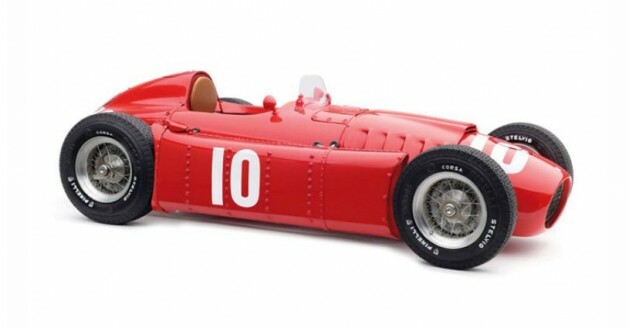 CMC Models Lancia D50 1955 GP Pau #10 Castellotti Red 1:18 scale with dimensions 26cm by 9cm by 8cm (h). Eugenio Castellotti was the youngest driver of Scuderia Lancia. Together with Ascari and Villoresi, he joined the newly-founded Grand Prix racing team in 1954. Due to many constructional delays in the im-plementation of the D50 project, the team did not get involved in racing until the last race of the 1954 season. Consequently team members split their time between the missions of Scuderia Lancia and other race events. Ascari won the 1954 Mille Miglia, Villoresi competed in Portugal, and Castellotti finished third at the Tourist Trophy. The long-awaited debute of the Lancia D50, however, was anything but suc-cessful. It appeared that the D50 was neither technically mature nor reliable enough for racing the long distance of a Grand Prix at this time. The heat wave that accompanied the Grand Prix of Argentina 1955 was a torture for man and machine. Again, none of Scuderia Lancia's cars finished the race, and the whole team was depressed. Nevertheless, abandoning was out of the question to proud Gianni Lancia. The successful performances of Lancia D50 in the subsequen Grands Prix of Turin and Pau provided a much-needed hope to turn thing around for the costly Formula 1 project. The Grand Prix of Pau was a car race held annually in the French Pyrenees region. It did not count towa-rds the Formula 1 World Championship. In 1955, the race event took place on April 11, and participants were to complet 110 laps, covering a total distance of 303.84 km. The Mercedes team did not take part in this race as its attention was focused on the race in Monaco. Ferrari did not appear in Pau, either. Their crushing defeat in the previous race of Turin remained too painful. Driving a Lancia D50 with #6, the double world champion Alberto Ascari got pole position. Unfor-tunately with the last two laps to go, he was caught in the misfortune of having a broken brake line. Jean Behra, a seasoned vetern, got to lead the race to the end in his Maserati 250F with #14. The highly-gifted Castellotti drove his #10 Lancia D50 to a second-place finish with one minute behind the winner Jean Behra. Roberto Mieres finished third in a Maserati 250F, and Luigi Villoresi, in a Lancia D50 with #8, came in fourth. Because of the time lost on repairs, Alberto Ascari only took a fifth place.